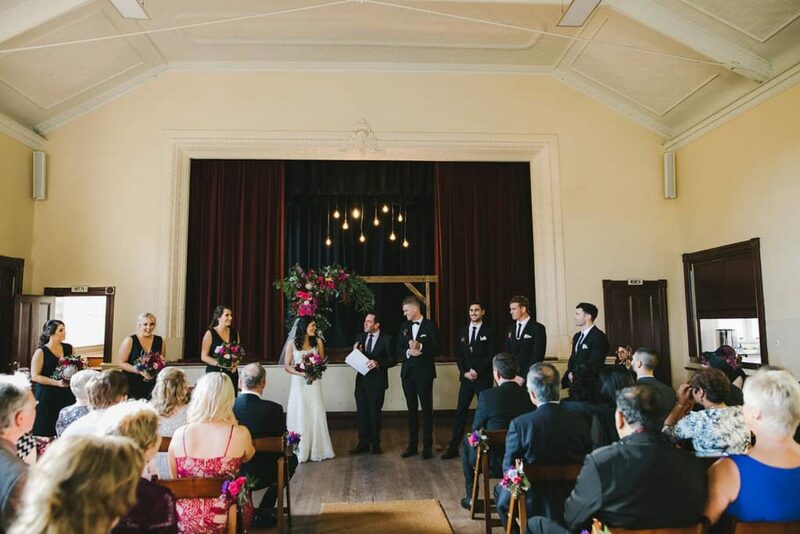 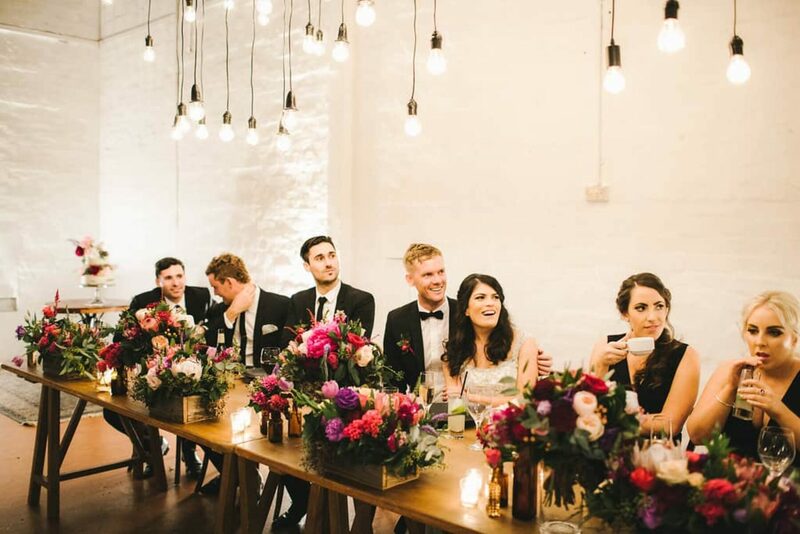 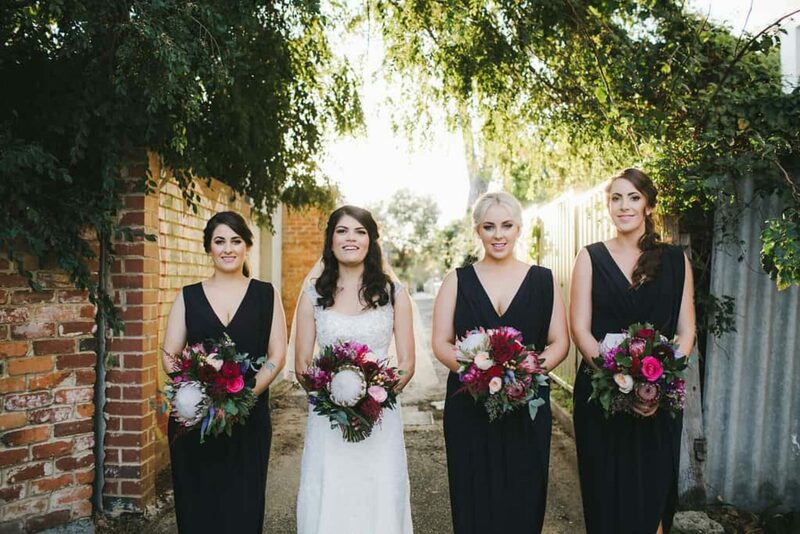 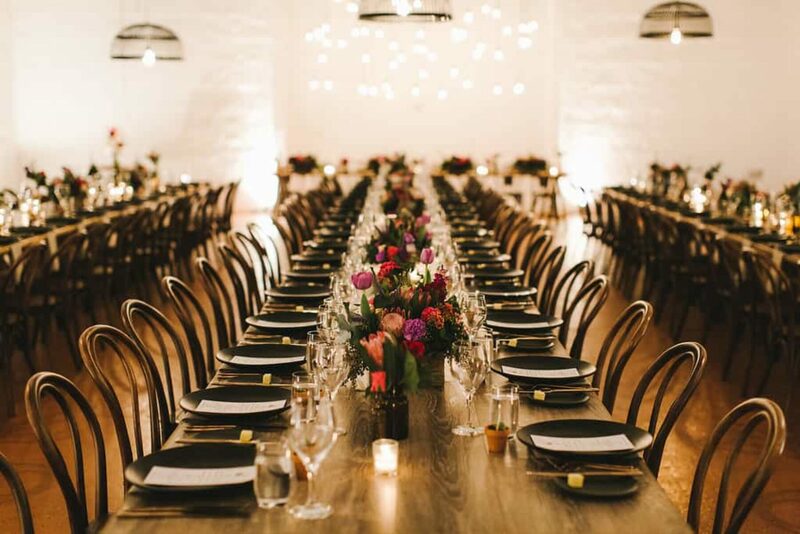 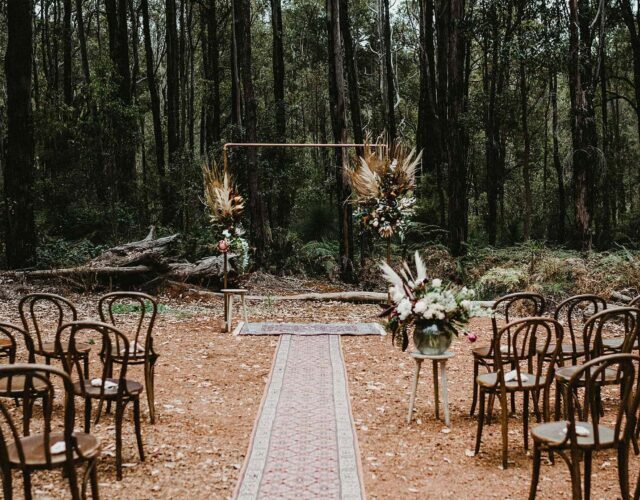 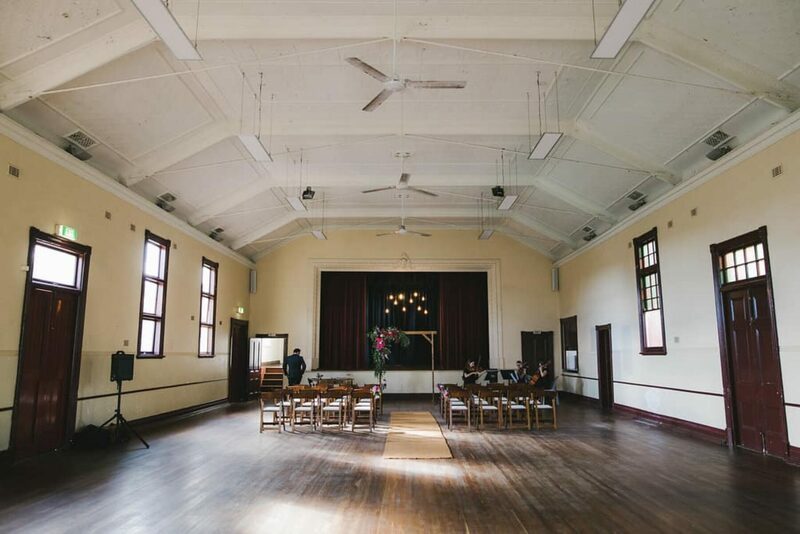 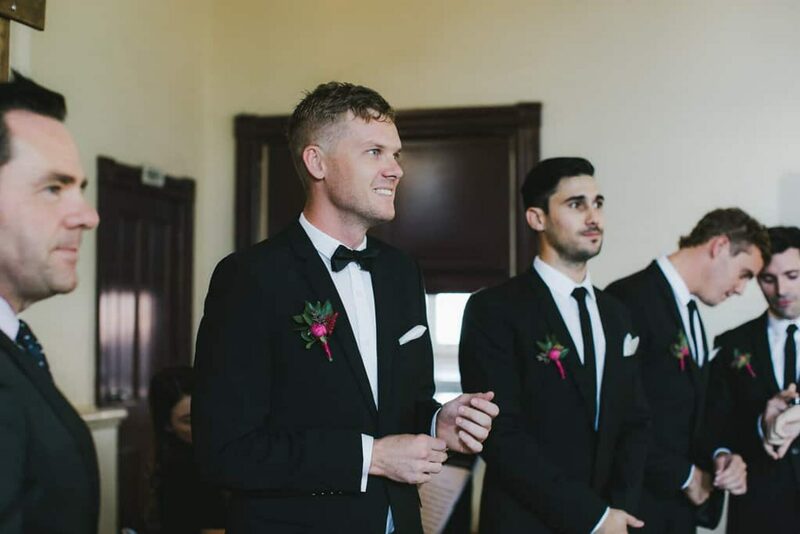 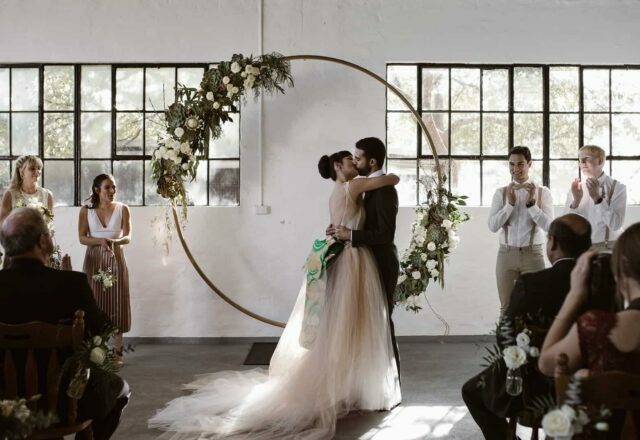 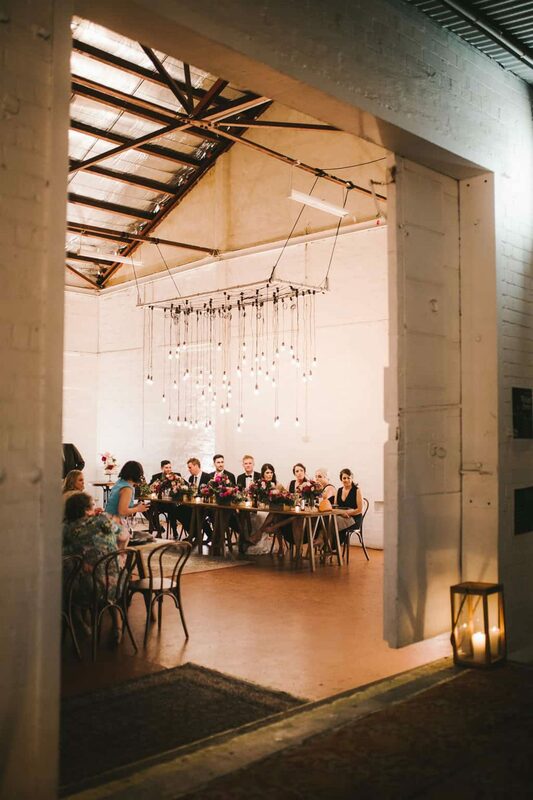 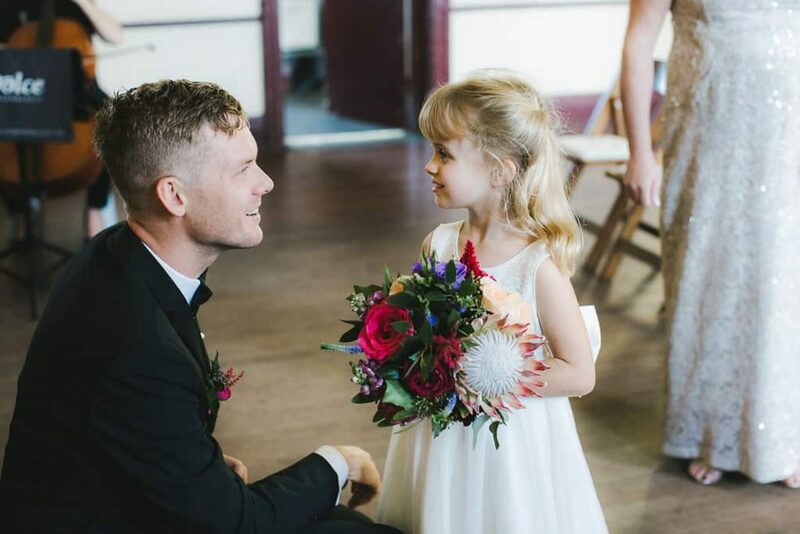 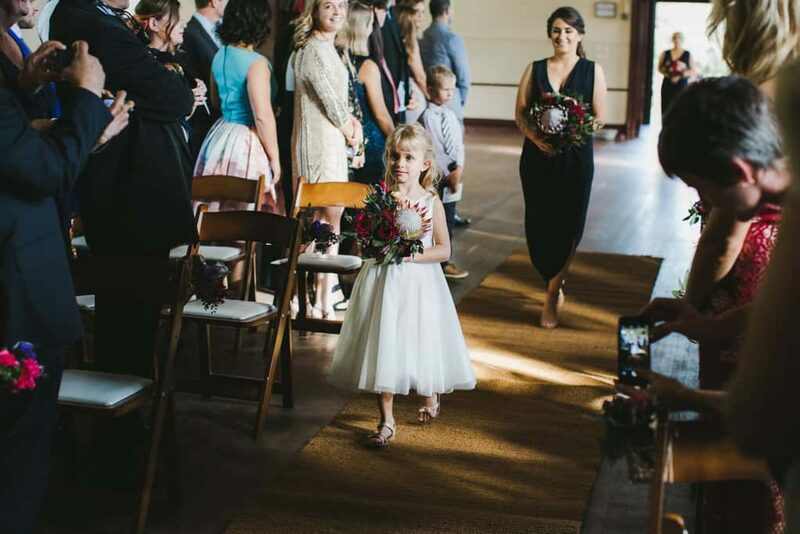 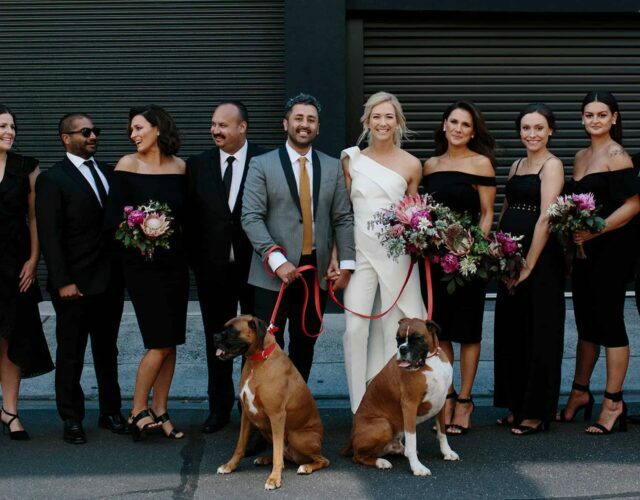 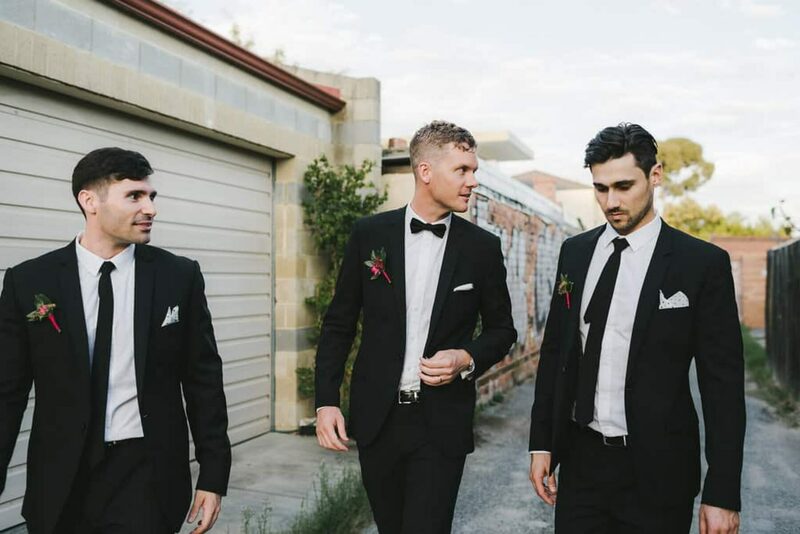 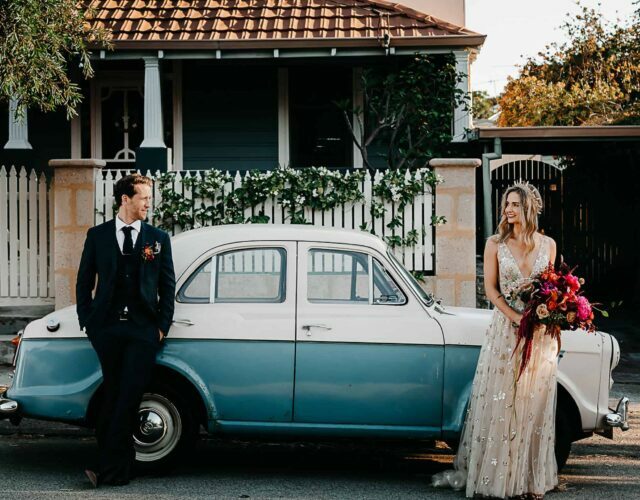 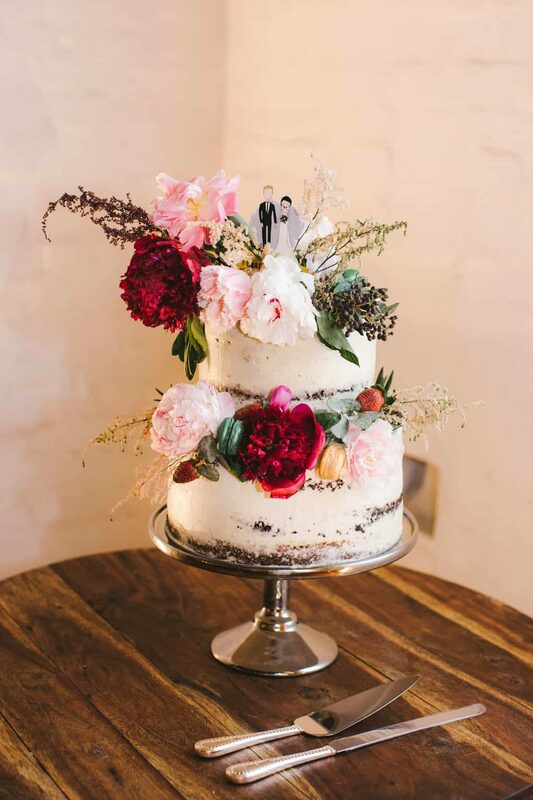 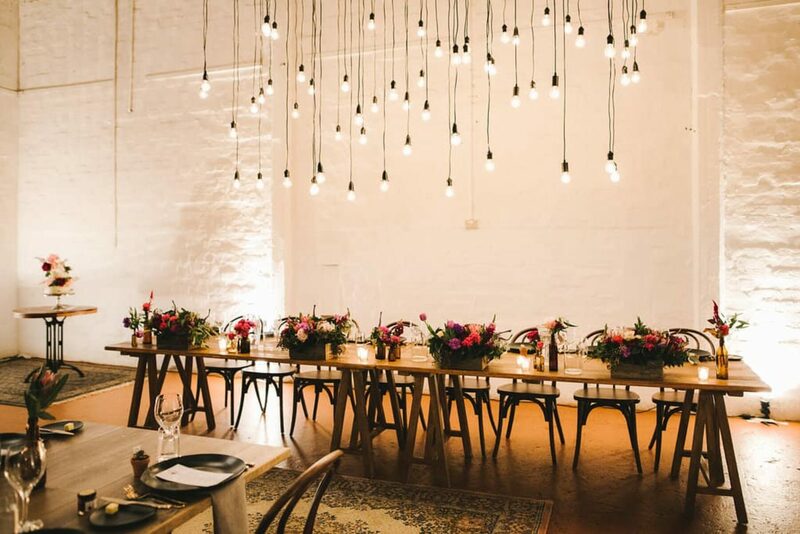 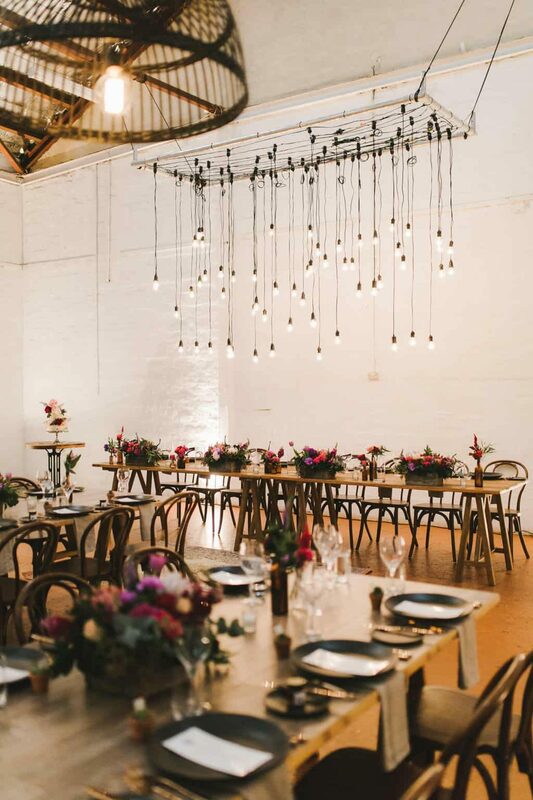 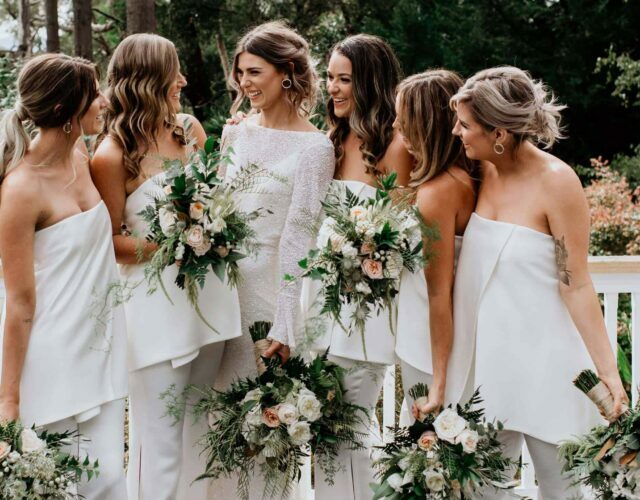 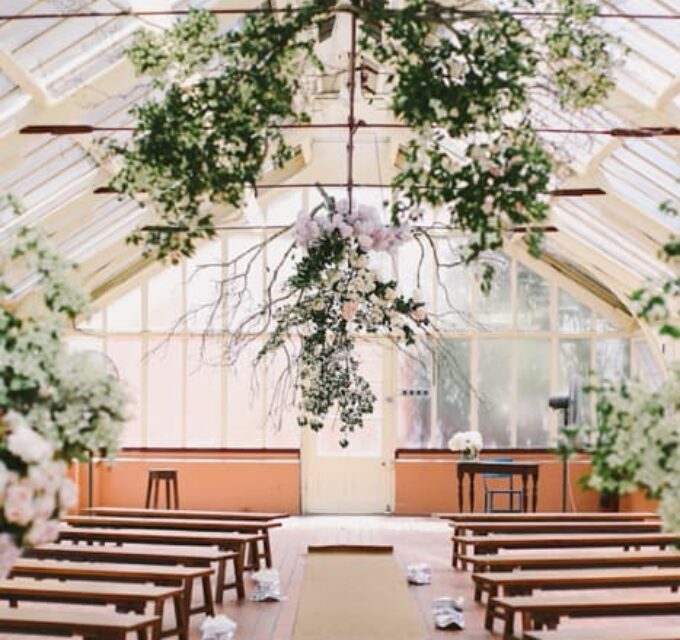 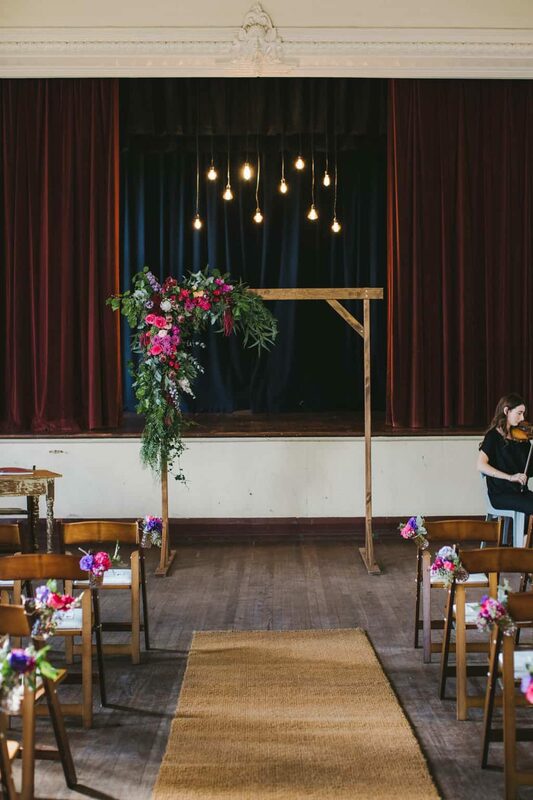 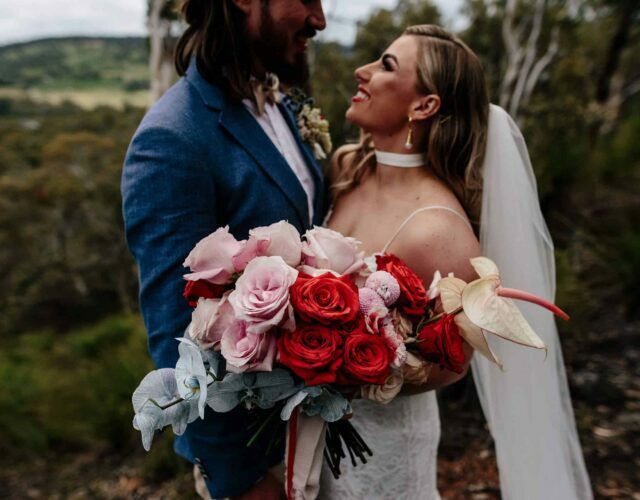 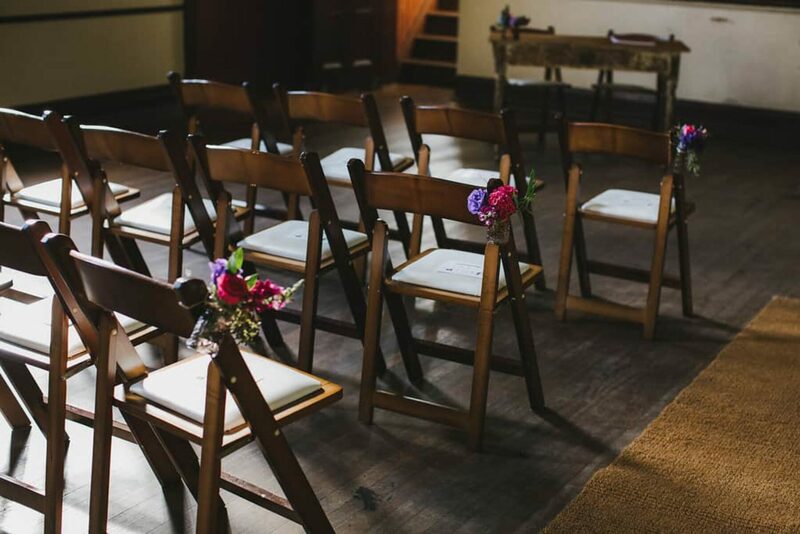 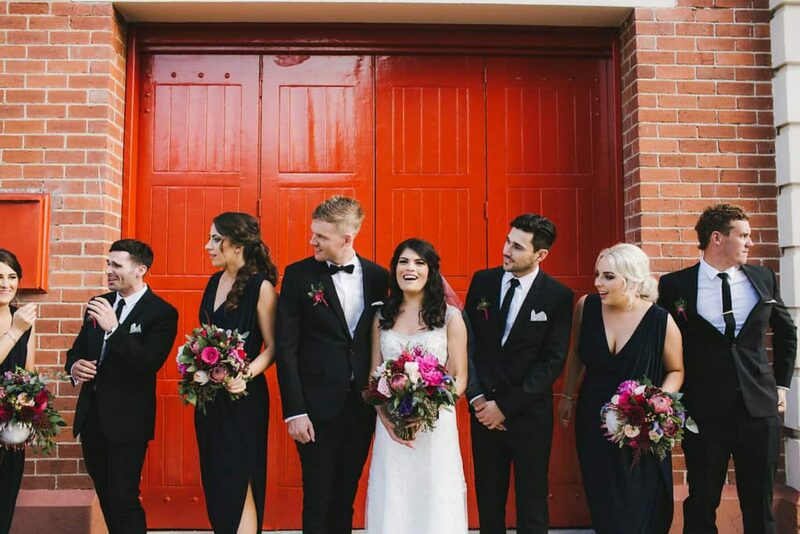 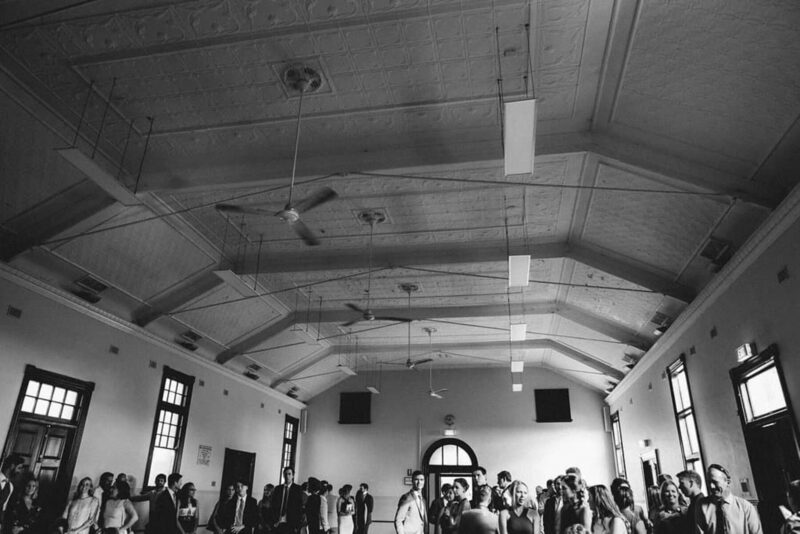 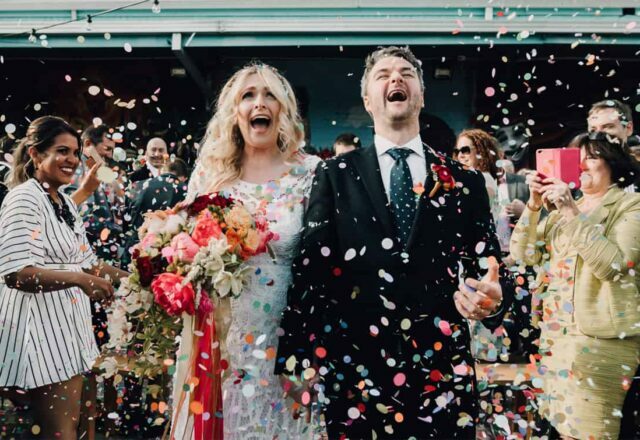 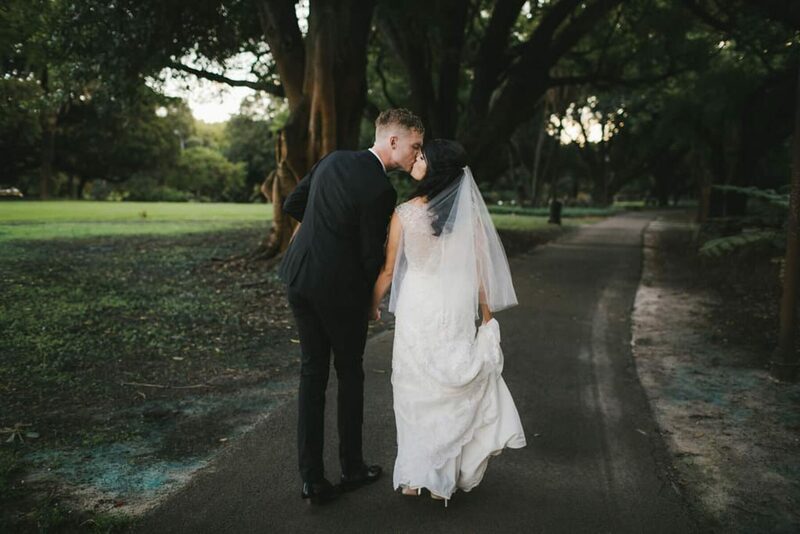 “One day we’ll be walking past North Perth Town Hall with our kids and be able to tell them that we got married there.” It’s a beautiful sentiment and John and Charmaine’s gorgeous town hall ceremony and stylish barn reception at Perth City Farm has us swooning. 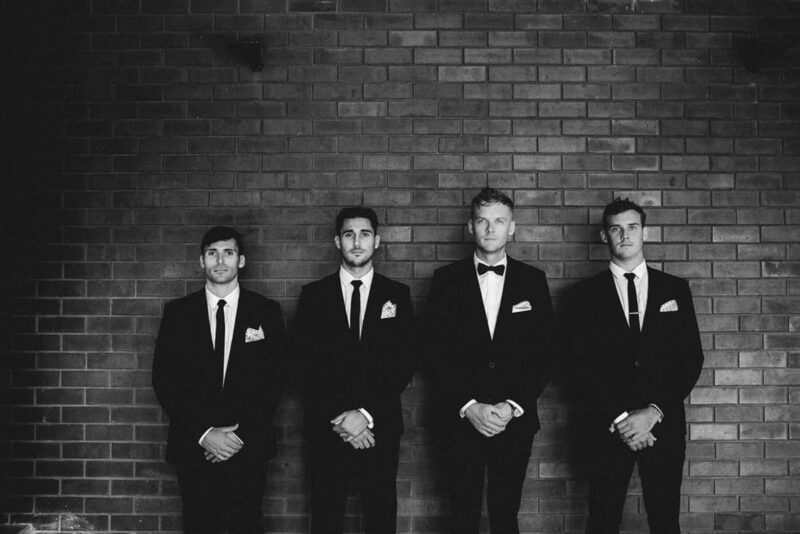 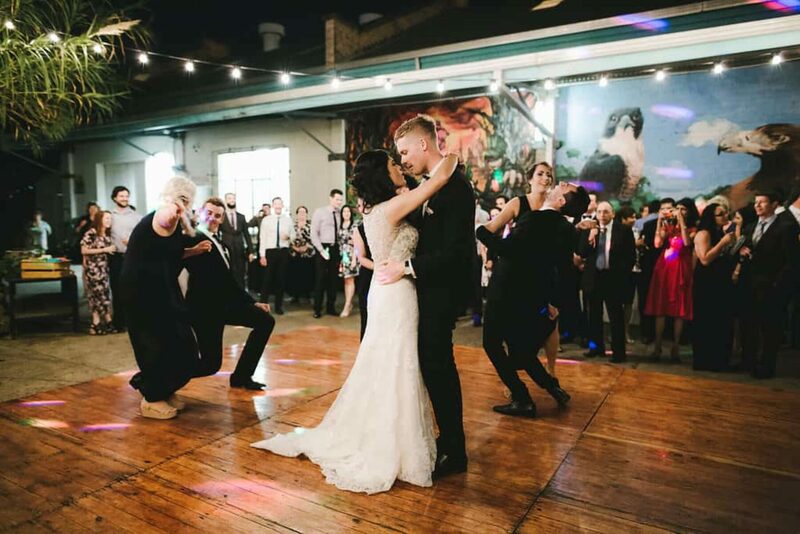 Amanda Alessi was the talent behind the lens for this one and she has truly captured one helluva wedding. 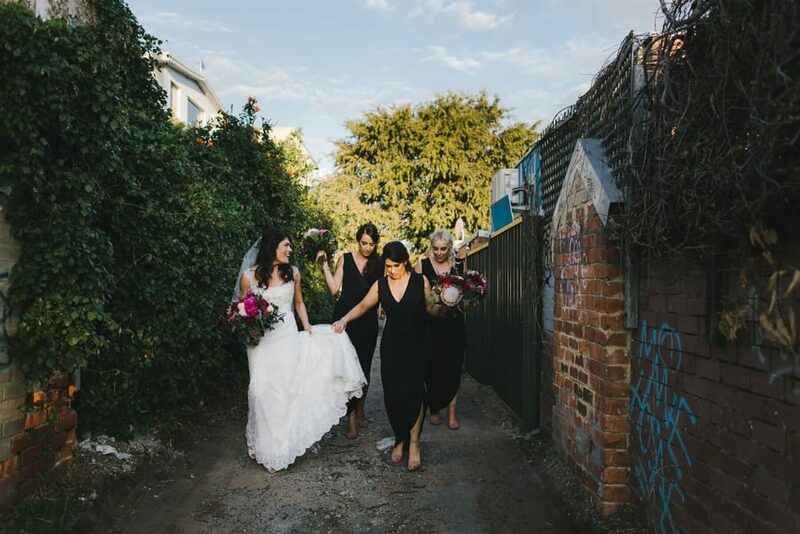 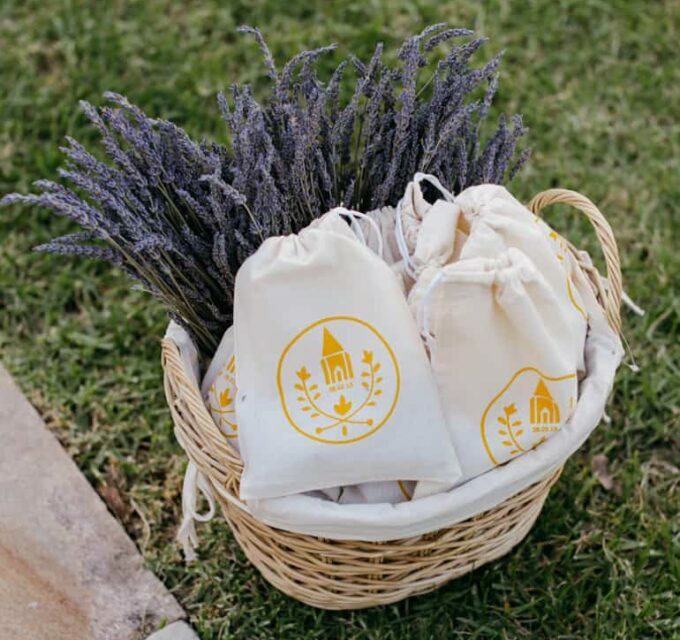 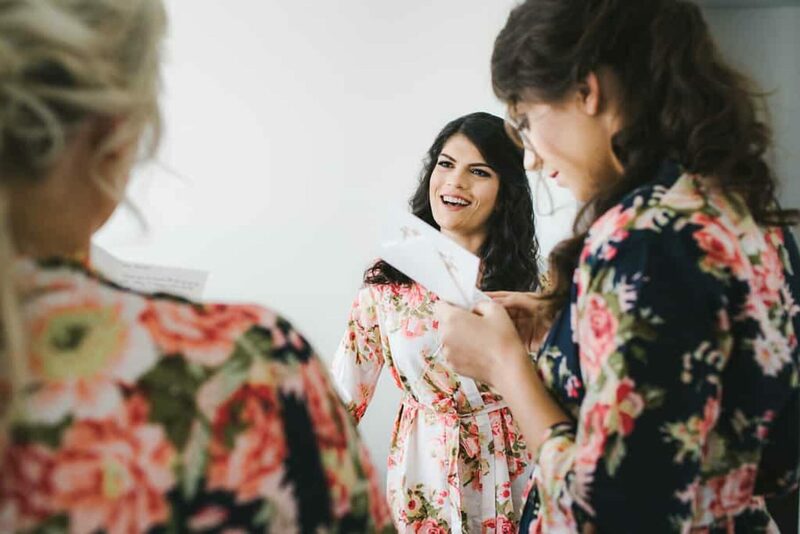 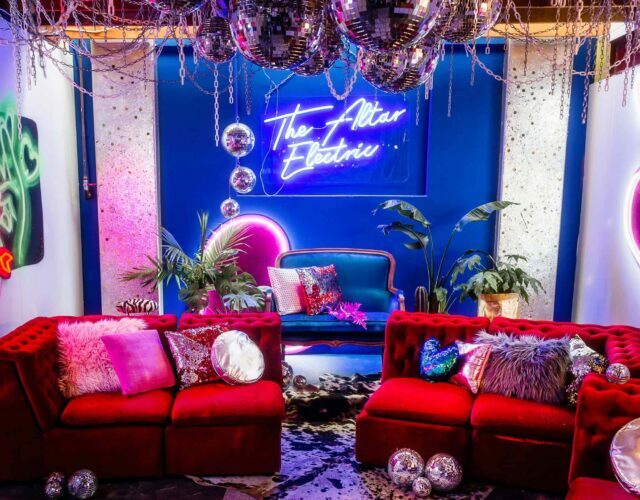 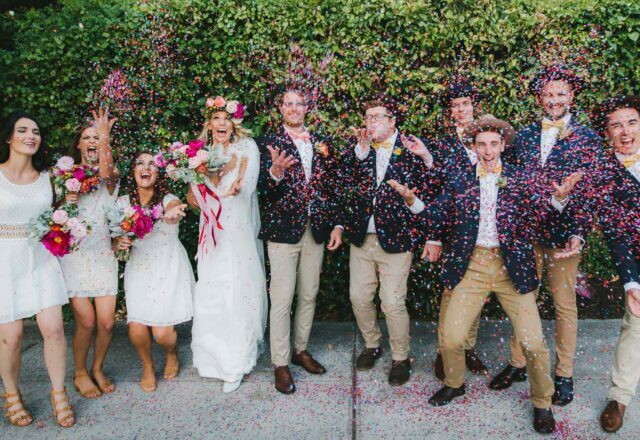 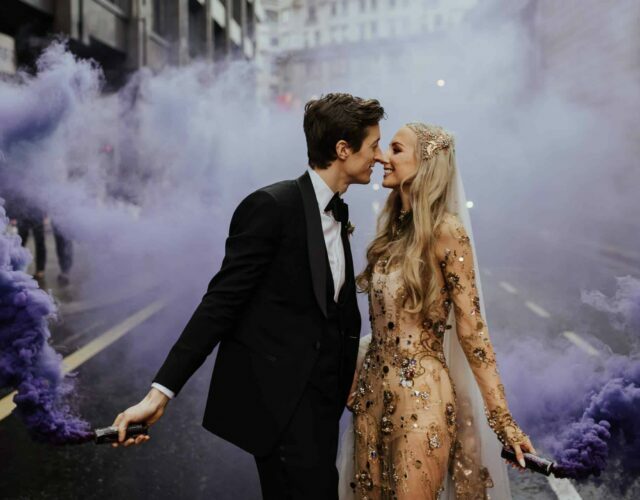 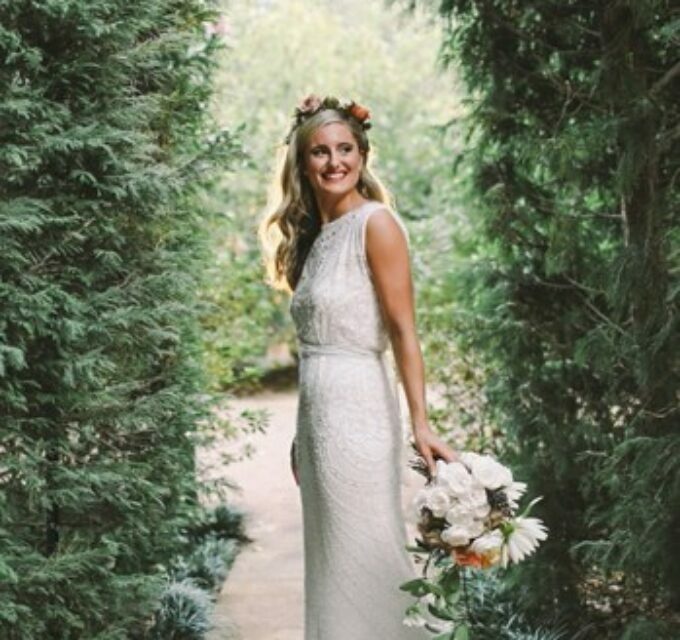 These self-confessed city dwellers chose each venue for its cultural and historical significance within their beloved community and though they didn’t brief their stylist, Camille of Studio Events, with a particular theme, they admit there was a definite unspoken, urban garden party vibe. 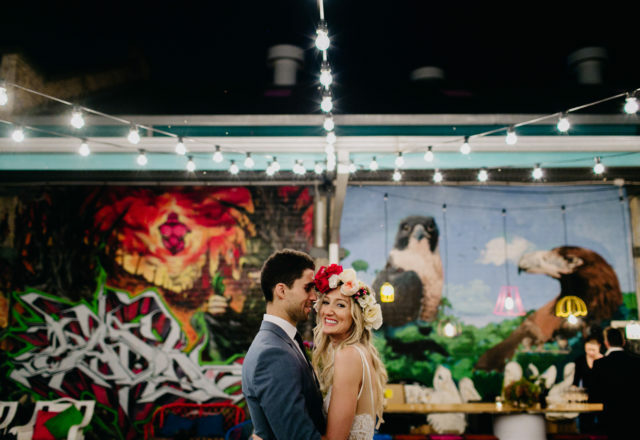 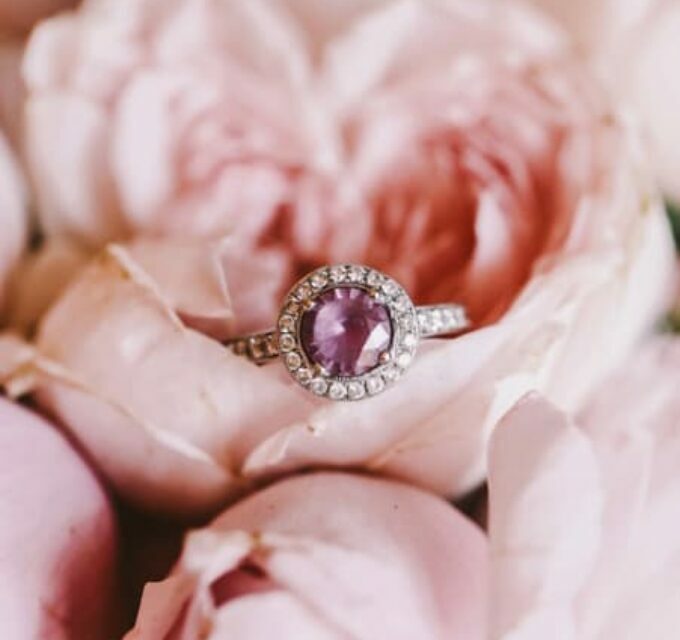 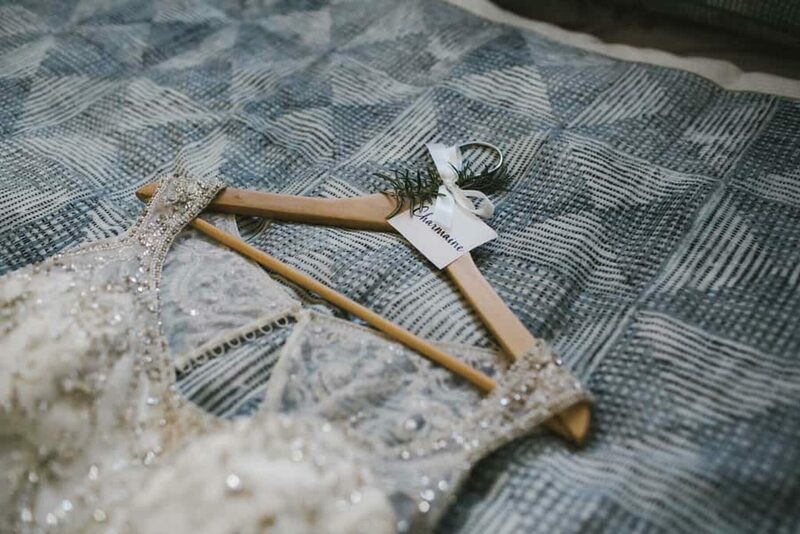 “We really put a lot of trust in Camille and as soon as we got to the reception venue, the inside of the barn took our breath away. 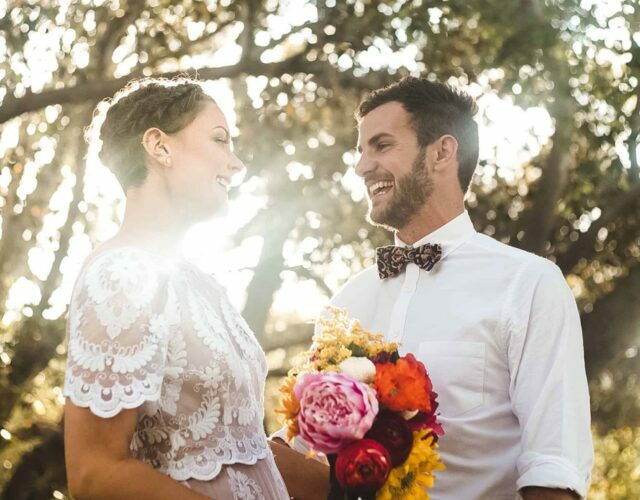 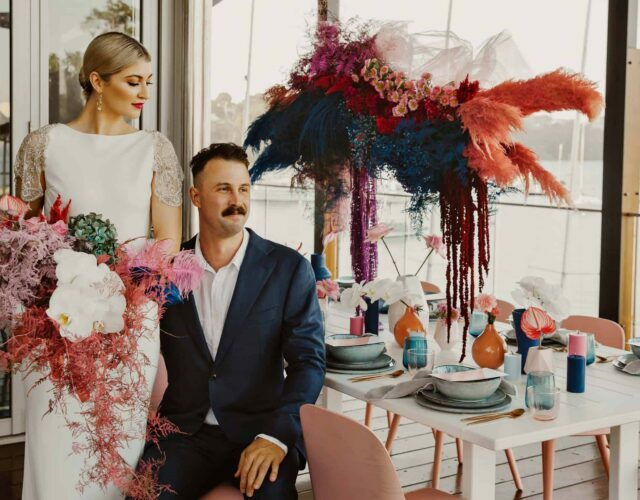 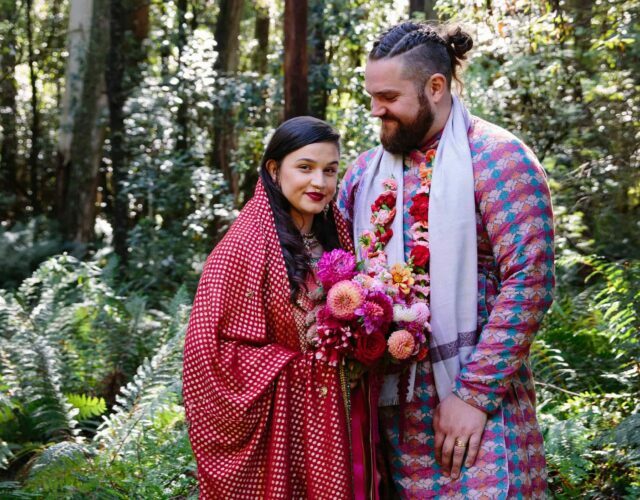 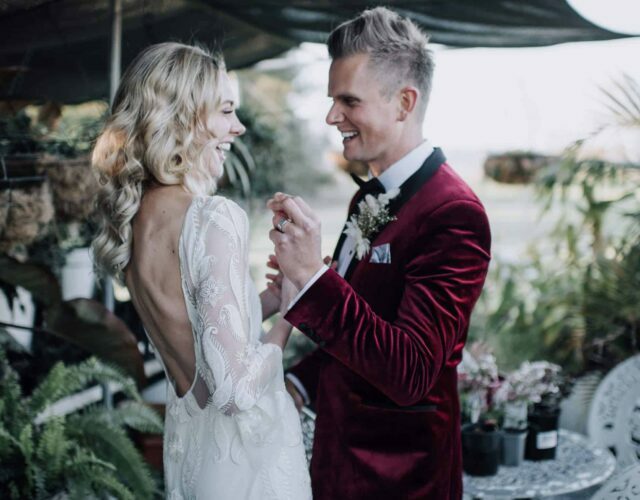 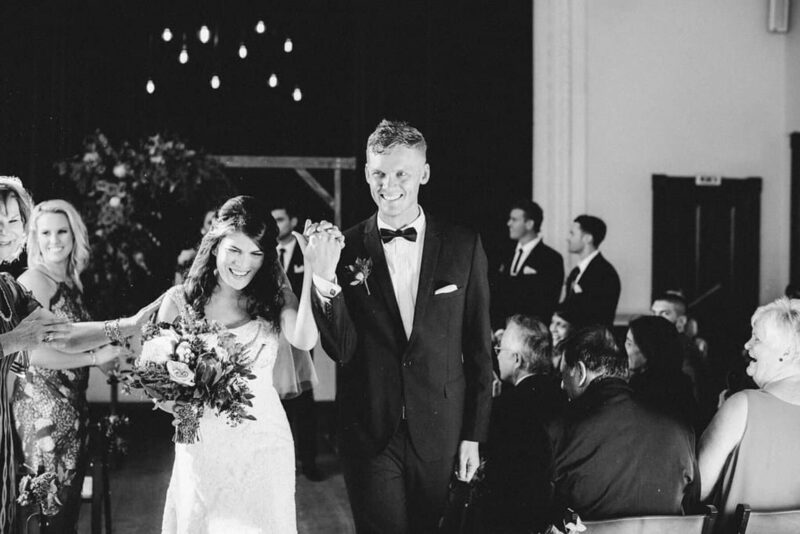 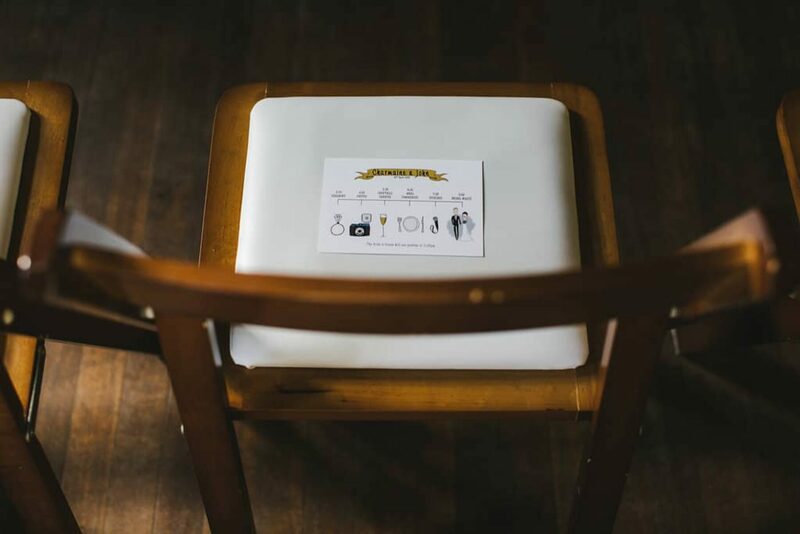 The styling definitely captured John and I as a couple, it was classy without being fancy and was fun without being too relaxed.” Charmaine tells us. 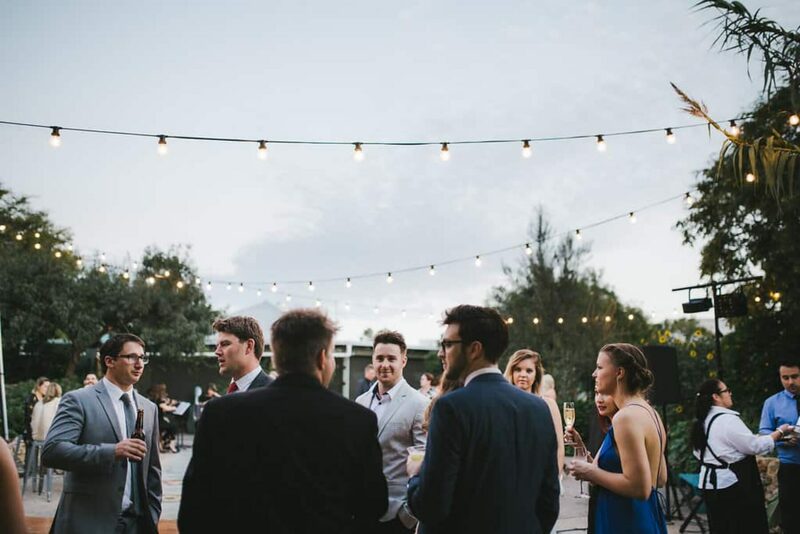 Prior to the couple’s arrival at the reception, Cocktail Gastronomy got the party going with three delicious cocktail flavours and Charmaine’s mum kept the 100+ guests satisfied with her homemade canapes, before everyone tucked into entrees and mains courtesy of Kent St Deli. 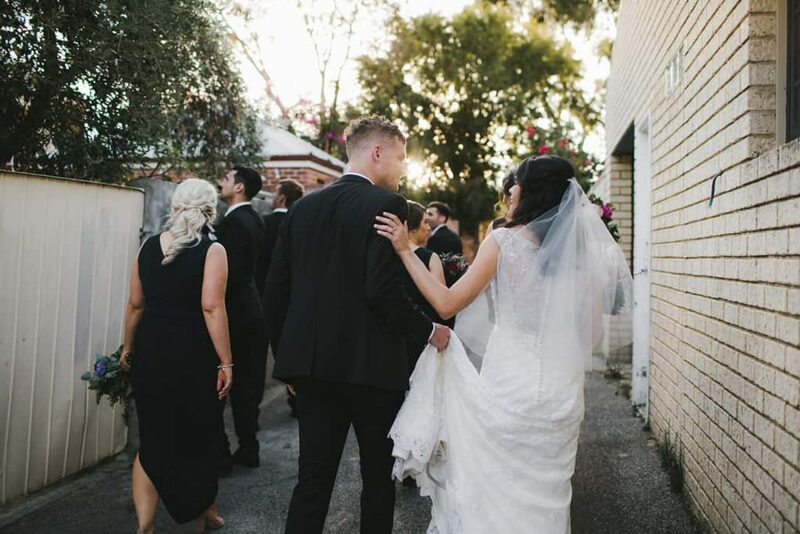 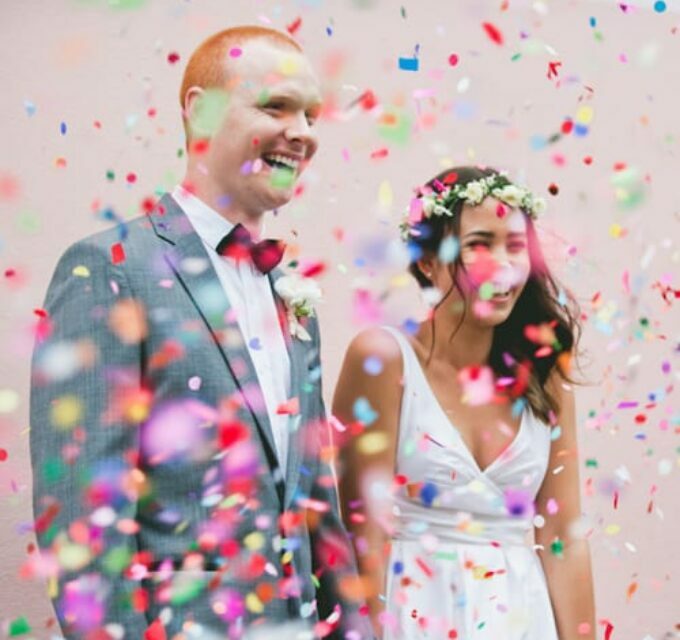 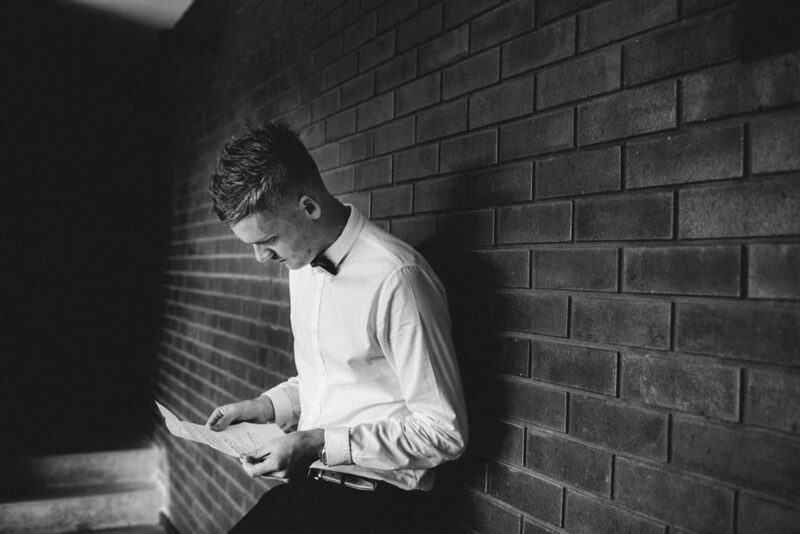 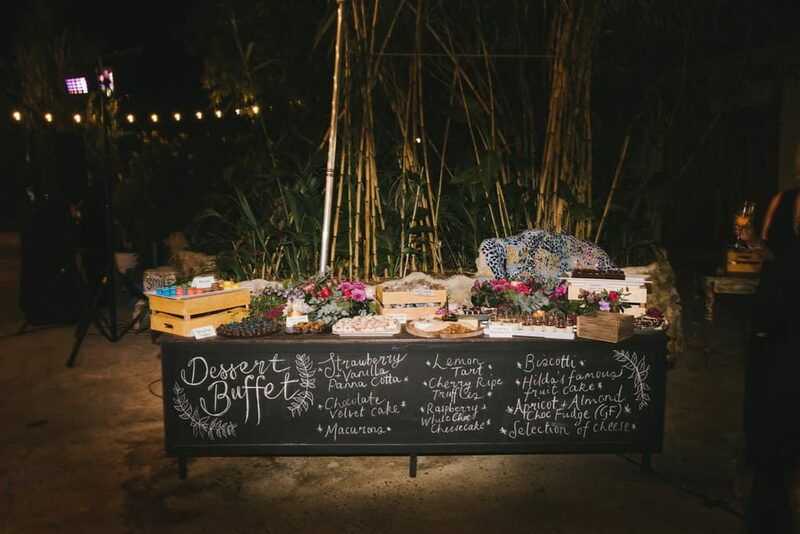 “By the time Charmaine and I arrived, people were in a great mood after spending over an hour socialising together over cocktails and canapés.” Says John. 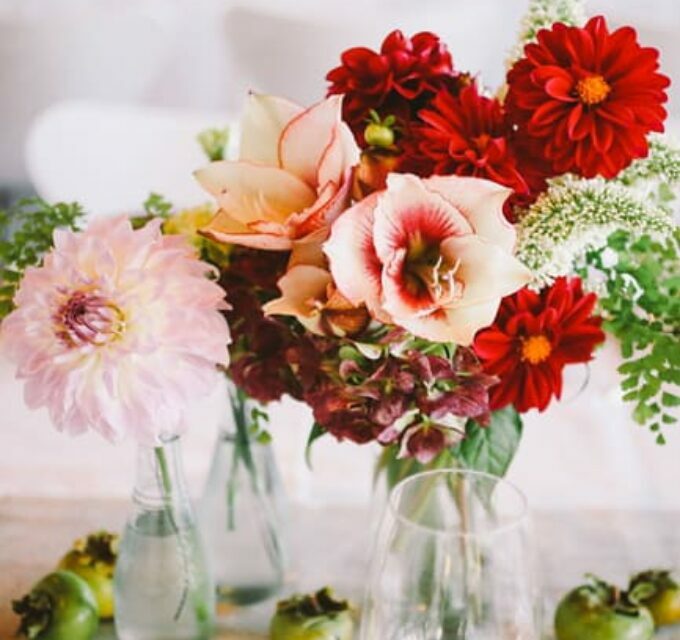 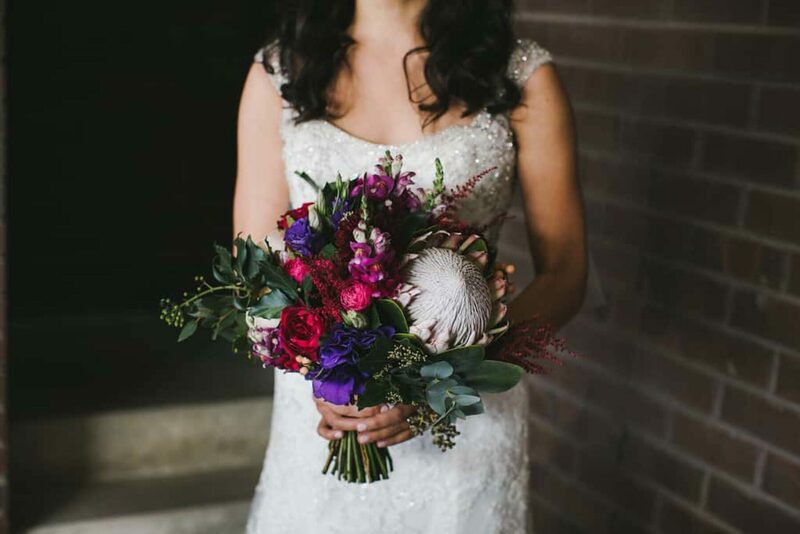 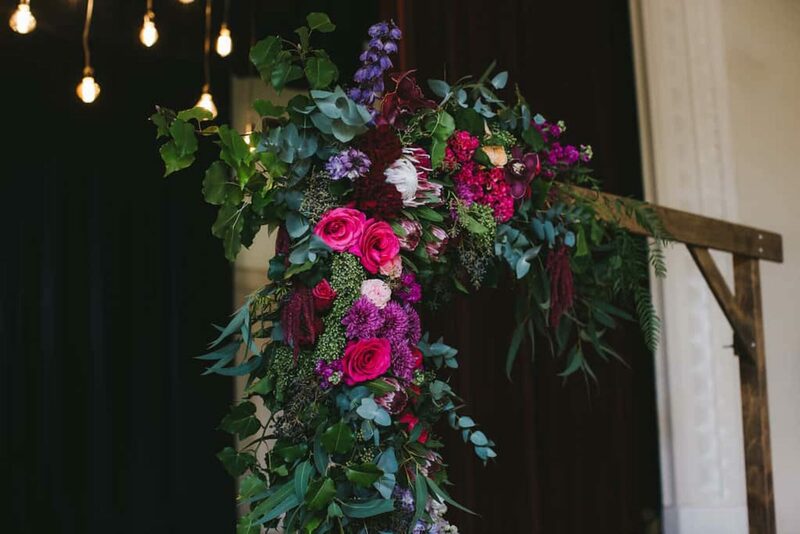 The floristry masters at Alice & Rose created the most gorgeous bouquets and jewel-toned floral arbour, perfectly styled by Studio Events. 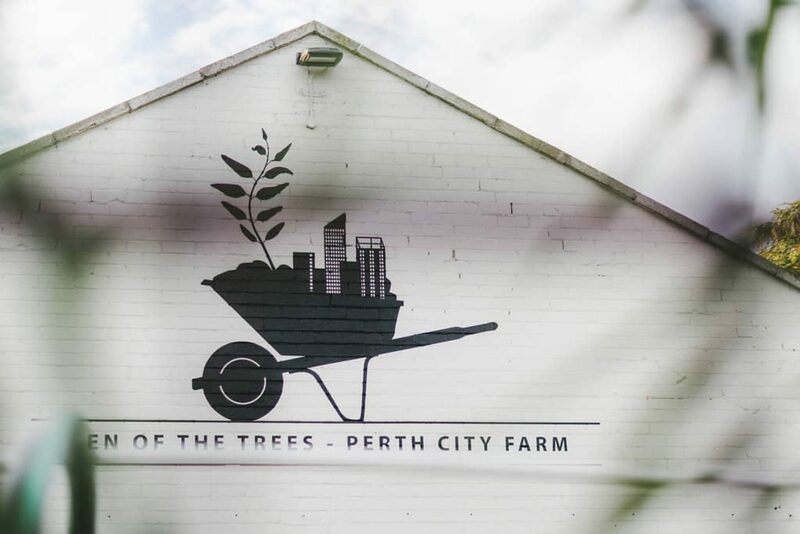 Close to home and home to their fave breakfast spot, Perth City Farm was an easy choice. 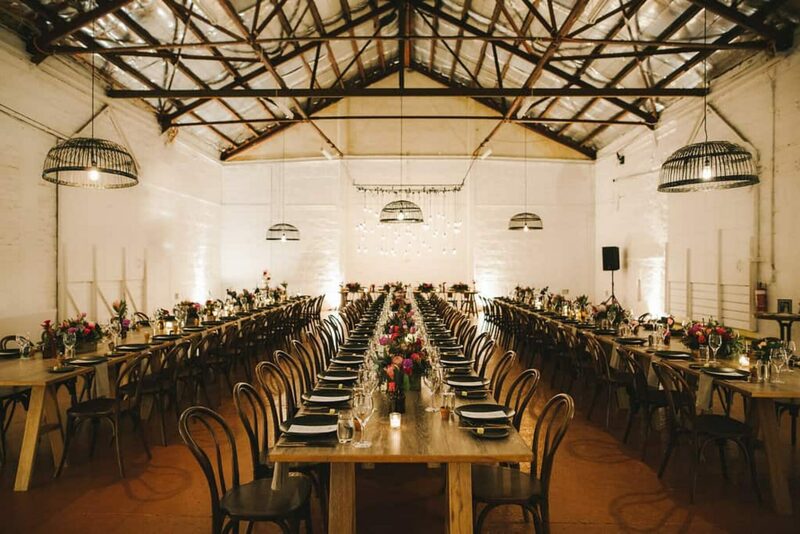 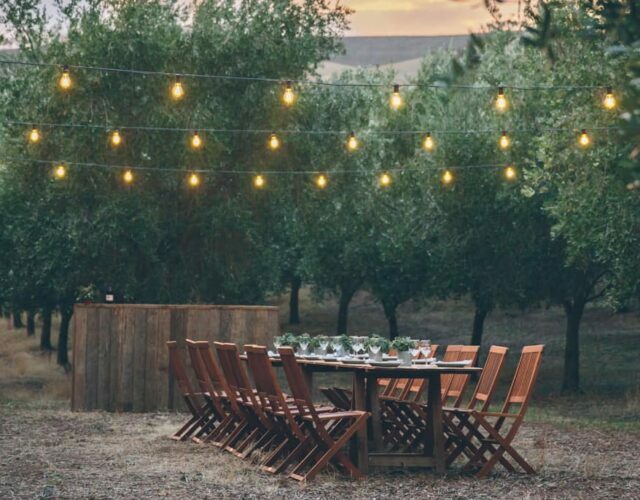 “When we found out that the barn out the back was available for functions our mind was made up. 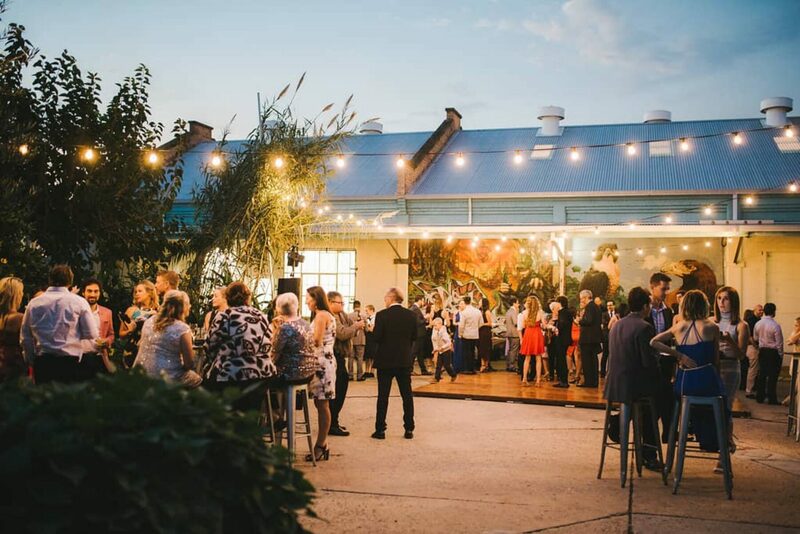 It is such a blank canvas – a bit of a hidden gem in the middle of Perth!” Says Charmaine. 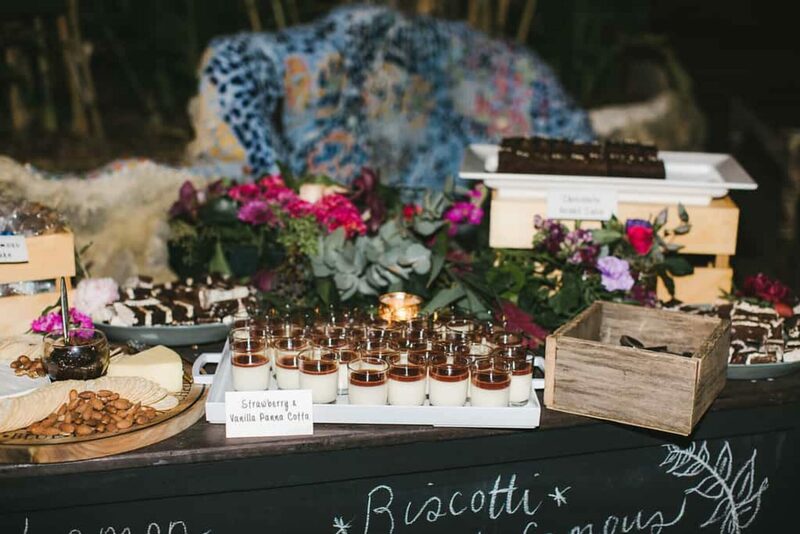 Aside from her incredible canape creations, Charmaine’s mother’s also made jam for the favours, which Charmaine jarred and labelled. 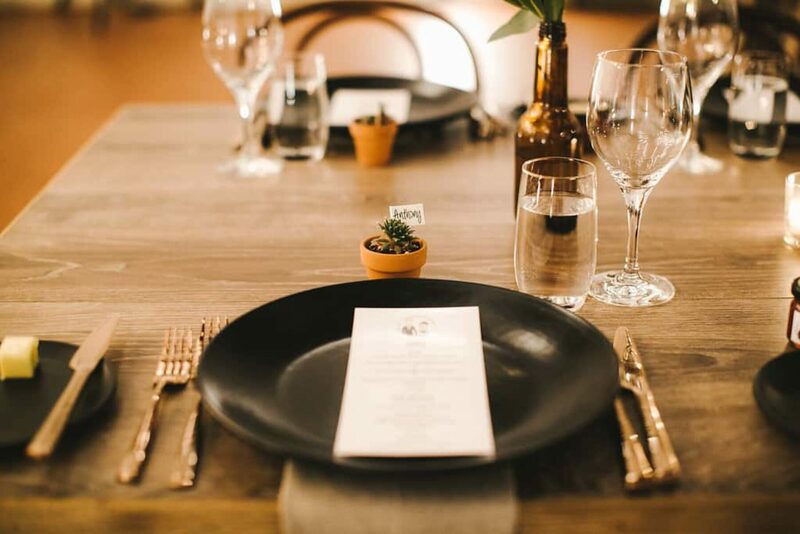 For place cards this crafty bride collected and labelled terracotta pots for succulents (provided by Succulents Perth), and John designed the seating plan. 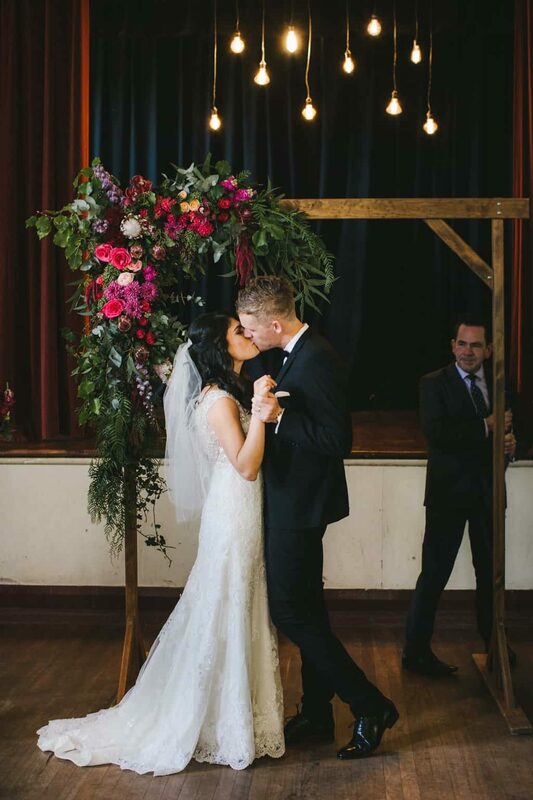 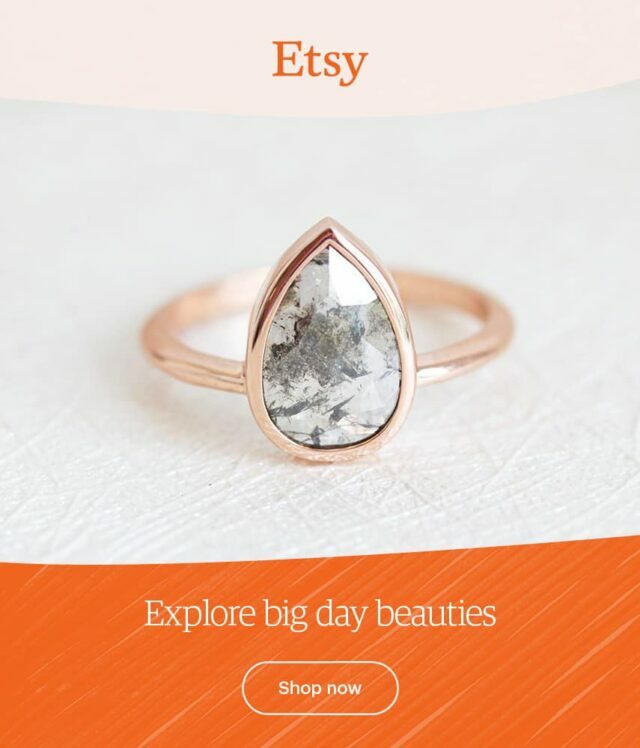 A damn good DIY effort! 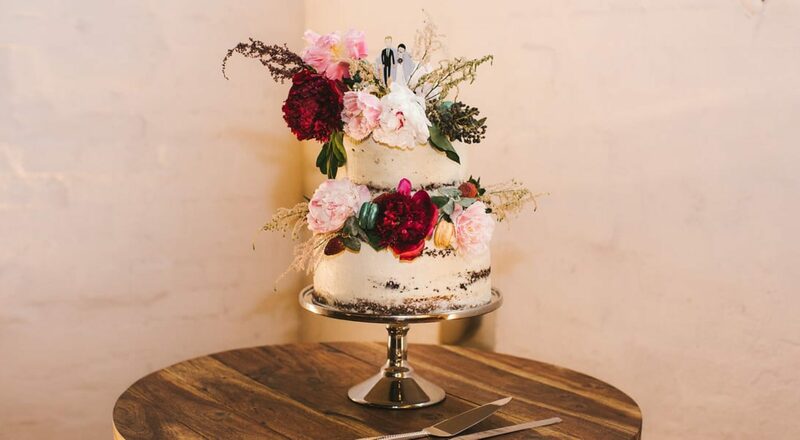 We know first hand just how delicious Sukar's creations are and reckon this Devil’s food chocolate cake with vanilla bean butter cream was every bit as heavenly as it looked!